Everything you need to know about getting your first tattoo. If you're new to tattooing, there's no shame in starting small. Give yourself a chance to learn the process, how your skin takes ink, and how your body heals. 2. Know your pain tolerance. Nothing wrong with pushing yourself, but on a first tattoo it's more than fine to respect your body's limits. If you're very sensitive, avoid choosing ribs, backs of knees, elbows, or groin areas for your first tattoo. Sun exposure and water submersion can damage a new tattoo, so beach bums in particular will want to avoid getting a new tat in the summer. Spring and early autumn are the most practical. You won't burn, but you can also leave any arm or leg tattoos exposed rather than covering them up with irritating fabric while they heal. 4. Don't do it on the cheap. Unless you have several trusted friends who can vouch for a suspiciously cheap tattoo parlour, if it sounds too good to be true, it probably is. You're altering your body for life. If that's not worth a decent investment, I don't know what is. Look into who you’re trusting your body with. Choose an artist at least a week in advance, and look over their portfolio before committing. Make sure you’re happy with their work and that their style fits yours. Shots of their work should be available in the parlour and online, and reading reviews of parlours and artists on Facebook, Yelp, etc. will help you determine if you’re comfortable. No matter how madly in love you are right now, putting your S.O.’s name on your body is a risky choice. Be 100% sure that you can stand behind your choice for the rest of your life. 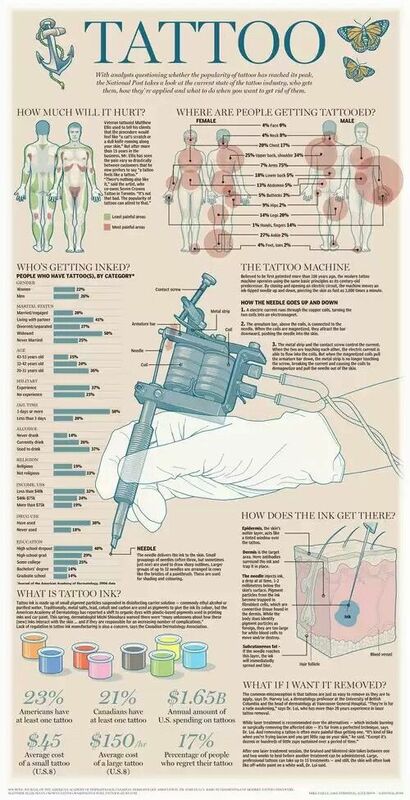 As a tattooist of mine once said, "You want it removed? OK, let me get the saw." 7. Keep your face out of it. Your cat's face anywhere on your body but your face is totally fine. Give yourself some time to be sure you’re happy with your choices — design, placement, artist. Spontaneity is all well and good, but marking your body for life is a big decision. While it's more than OK to choose something that isn't the be all end all of your existence, make sure you are making your decision in the right mind and for the right reasons for yourself. 10. Buy something like Bepanthen+ in advance. Your tattooist may or may not supply you with care cream, so to be safe, pick up a tube of Bepanthen+ at a pharmacy in advance of your appointment. This nappy rash cream is excellent for sensitive and sore skin, and will keep your fresh tattoo from spurting blood at inopportune moments. If your tattoo artist gives you care cream, use that and double check there's no problem in using an over-the-counter ointment like Bepanthen or Aquaphor. Apply it at least twice a day for several weeks. During my first tattoo, my tattooist said he’d had a lot of girls cry and hyperventilate during their firsts — before the needle even went in! Panicking will only ruin the experience, which should make a good memory, so take a deep breath, prepare for a little pinch and a little scratch, and know that it’s not worse than that. If you've got any nerves, don't go alone. If you can, bring a friend who's been tattooed before (and had a good experience!). Having someone to talk to, and someone you trust to walk you through the process as it's happening will work wonders. It's especially helpful to have a friend if you're getting a tattoo done on an area you can't see, so they can keep you informed on the progress! It’s your body, so take control and get all the information. If you’re not sure what an instrument is, or if any cream or ointment is being applied to your skin, don’t be afraid to ask what’s happening! 14. Bring a visual aid. It should go without saying that you should supply a visual example of what you want. Even if you want an artist to customise a design for you, attend your appointment (or pre-meeting) with inspiration. If you want a specific text used, bring your chosen words along in that font. If you've seen the exact tattoo you want online, bring it in. Print versions are ideal, as your artist can use it to create a stencil or transfer. 15. You might get shaved. Depending on where you’re getting inked and how hairy you are, you may need to shave or be shaved. If you're getting a tattoo on a place you shave for everyday maintenance, don’t shave again until after it’s healed completely, and don’t use any other hair removal products on the area either. If you're satisfied with the result, show your gratitude. Tip between 15 to 30% of the session, and take extenuating circumstances into account. A tattoo artist opened up his studio for me on his day off earlier this year, so I showed him it was worth it! 17. Don't be afraid to go back for a touch-up. If a line isn't clear enough, or a shadow not well filled in, go back and ask for it to be fixed! It's better for small details to be done too lightly than botched the first time, and so this can happen due to an artist's caution. If, within the first couple weeks of healing, you want something adjusted, get in touch with your artist and set up a touch-up. If you've been a good client and tipped well, this should be an easy arrangement! 18. Know how things are going to work in the shower. You don't want to keep a scabbing tattoo wet for too long, and if you like scalding water, you'll make it sting. Once you've decided on your placement, have an idea of the most convenient bathing and showering method for the first couple of days. This may include placing cling wrap over the area, or gently washing before keeping it out of the stream for the rest of your rinse. 19. Follow your care directions. Your tattoo artist will likely tell you how to move forward caring for your healing tattoo. If you’re not satisfied with their advice, this guide is a good reference. Either way, it’s important to provide daily care to your healing skin. 20. Other people will make your tattoo their business. 21. If it's right for you, it's right. An image has been removed from this post by request.